After Swahili lessons this morning would meet a friend at Mama Matunda (‘Mama Fruit’). I go there for a bowl of fresh mango, pineapple, melon and avocado almost each day. Healthy and cheap lunch. But today, mama’s stall was not there. I asked a man who was standing there. Where did she go? They chased her away, because of security reasons, the man said. They destroyed her stall because thieves are hiding inside? , I asked the man. He was laughing, in a sad way. ‘The thieves are winning from this government.’ It is the same story as some weeks ago. Nairobi’s City Council keeps on chasing away honest Kenians like mama who try to make an income to survive with their families. A few weeks ago, i took this picture. Mama was happy by then. She told she had to pay her license on a daily basis, 25 shilling, which is about 25 eurocents. 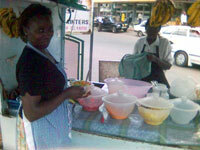 She sells her fruitsalads for 30 shilling(big one) or 20 shilling a small one. I guess she doesn’t make alot of profit on these salads. Where do all her customers have to go now?